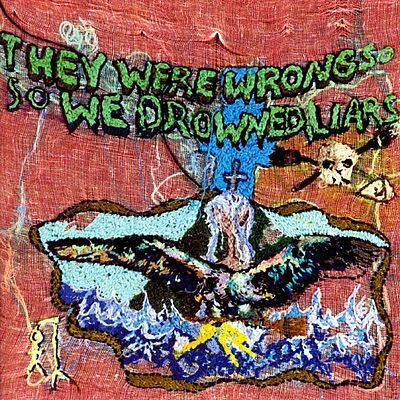 ‘They Were Wrong, So We Drowned’ is perhaps best known as a couple of things that it really isn’t. It was cast as a concept album (or a ‘story album’ according to Angus Andrew) about witch hunts, when in fact it simply uses related research material as it’s leaping off point. Whilst the album seeps and creeps with blood, folk horror, paranoia and devilry, this is no ‘Salem: The Musical’. Secondly, and partly because of the focus on this first general misconception, in some circles it was regarded on it’s release as a piece of unlistenable trash. Notoriously both Rolling Stone, and Spin, admittedly not known for boosting experimental art rock, gave the album their lowest possible scores. Many more generally sympathetic followers saw ‘They Were Wrong…’ as a major misstep. One can hear why they may have been confused. The record moves away radically from the aggressive punk funk of the New York band’s debut, creating instead a dark, dense, buzzing environment which threatens to swamp the listener. What’s hard to believe is that serious critics could have found the album unlistenable. It’s packed with ideas, and whilst some of them may seem like pat moves now, creating clattering, bass-free percussion from whatever they were able to hammer combined with subtle, disorienting electronic effects, Liars built a record which would have taught Animal Collective a thing or two back when it was released in 2004, preceding ‘Sung Tongs’ by a number of months. If all this makes the record sound like so much formless sonic masturbation then forgive me and go listen to it. ‘They Were Wrong’ bristles with rhythm, tone, downtuned melody and inescapable atmosphere. The first time I heard it, and I was put off sufficiently by the reviews to make it the last of the five Liars albums I bought, I thought there wasn’t a bad track on it. Now I think it’s my favourite of theirs, and it works perfectly in the trajectory of a career which would take them next to ‘Drums Not Dead’, at which point all the nay-sayers presumably swallowed something hard and jagged and realised that Liars are, and always have been several steps ahead of them and their hipster moves. Tom Listened (a long time ago): I can just about remember being mightily impressed by this record. Sure, it’s a difficult listen (many of our recent offerings seem to have been) and it started off pretty impenetrably, but as the record wore on, its variations and diversity became apparent and there was just enough there to make it an intriguing and wholly captivating listen as opposed to a chore, a record where you sense that time invested would be paid back in spades. I like Drum’s Not Dead, actually it would be truer to say I admire it more than like it, and I wonder whether this feeling would be replicated for all of Liar’s discography, but on listening to They Were Wrong… the other night I felt as though it would be a good place to start widening my investigation into this theory beyond its current sample size of one record! Nick listened: I bought Drum’s Not Dead when it came out but, on first listen, was expecting something other than what came out of the speakers, and so decided Liars must be rubbish, and stuck it on a shelf where it sat, ignored and scorned. (The L section of our collection is also on the lowest shelf, by the floor – things down there seldom get picked, whilst lesser favourites at eye-level benefit from casual browsing.) But, primed by Rob’s introduction, I enjoyed this, and got more of a sense of who Liars are and what they’re for. I’ve listened to Drum’s Not Dead again subsequently, and wonder if I may have been a little harsh, and should try again. Recognising the final song (of Drum’s Not Dead) from the film 50/50, which Em and I had seen about a week before, seemed to help.